I have 30 blog post ideas floating around in my head. I recently saw this commercial starring Maroon 5’s Adam Levine on ADHD — someone other than Ty Pennington from Extreme Makeover:Home Edition is being vocal about his Adult ADHD! Adam spoke about having 30 song ideas in his head and struggling to focus to write songs. So, which of my ideas should I focus on in this post? I could blog about how my day to day activities are affected by my ADHD. I could write about how I feel at 8pm when my daily dose of stimulant wears off. I could write about how I can walk through my life every day with no one I don’t directly inform knowing I have Adult ADHD; my disability is pretty much invisible until I get hyper or nervous and blurt out that I’ve got it. I think I’ll write about invisibility today, because if I don’t lose momentum, I can always write out my other post ideas another time. I am a 28-year-old woman (diagnosed with ADHD at 20), who can look back and remember fitting the profile for the “disorder” (perfect word for ADHD dis-order) since before I began kindergarten. ADHD can often be invisible in females until puberty as they present symptoms differently from males: They often display more inattentive behaviors prior to puberty and are not jumping around the classroom or blurting out answers. I was quiet, shy and stayed below the radar. I also got good grades — when I was growing up, it was widely thought that youth with ADHD weren’t intelligent (this idea is still out there, but not as widespread as in the 1980s). Finally, when I was with my therapist during my sophomore year of college, I told her how frustrated I was that I would read one sentence in a textbook and forget it by the time I read the next one. My doctor had a big ah-ha moment and went through a checklist of symptoms for me: check, check, check. I had my ah-ha moment the next morning when I took my first stimulant. For the first time in my life, I read and understood an entire non-fiction book for history class and followed it up by writing a thoughtful paper. Typically, I wrote papers based on lectures from my professor, rather than from books: my inability to process written information easily allowed me to develop better verbal learning skills. 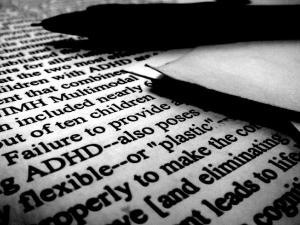 The invisibility of my childhood ADHD — hidden by my gender and my intelligence — prevented me from early diagnosis. It wasn’t just invisible to others; it was even invisible to me. And, now, my age hides it for me. I have learned and developed a plethora of mechanisms for containing and improving my symptoms. I can hide in situations that require it and that can be a gift. At other times, I wish people just knew, so I wouldn’t have to “come out” about it and risk others thinking differently about me. I do come out, though. I do tell others about my ADHD, because it’s important to advocate for myself and to, hopefully, make it easier for my peers to advocate for themselves some day. I think that’s it for this post. No advice from me yet. Just wait, it will come. In the meantime, if you think you might have ADHD, this WebMD self-assessment quiz might be a good place to start. Treatment, medicinal or not, is important.